As the master of ceremonies recited various statistics -- "41 per cent of CIOs say the Cloud is transforming their businesses!" - a corresponding percentage of wristbands lit up, filling the darkened arena in Las Vegas with a twinkle of green and red dots, turning the audience into a "human bar chart," as the MC put it. Interconnect marks a number of firsts for IBM, including the first iteration of the conference itself. IBM has historically held smaller conferences built around individual technology areas, rather than big-tent events more akin to Oracle OpenWorld. 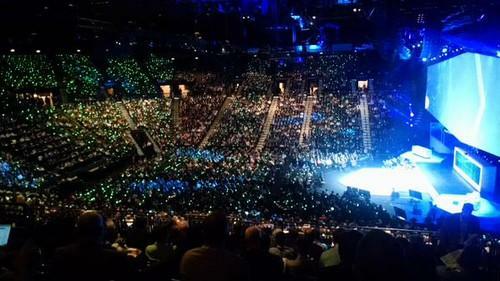 The event in Las Vegas this week has attracted 21,000 attendees, according to IBM, over 40 percent of whom haven't been to an IBM conference before. The Cloud, and by extension LeBlanc, is vitally important for IBM, which has posted successively lower revenue for the past 11 quarters. IBM is making Cloud computing a core element of its service portfolio, and it claims its cloud business grew 60 per cent last year and brought in $7 billion revenue. LeBlanc worked hard to convince customers that moving to the Cloud is the way to go. "If you don't believe your industry is changing then you'd better step back and look what your competitors are doing," he said. "It's much more fun to be the disruptor than the disrupted," he said, urging the audience to think about how the Cloud, data analysis, mobile computing and the Internet of Things could transform their businesses. "LeBlanc delivered exactly what IBM needs in terms of explicating the company's vision," said Charles King, principal analyst for the analyst firm Pund-IT. "Far from the gauzy, amorphous claims that some other cloud vendors rely on, IBM is focusing instead on workable solutions and repeatable results." IBM brought a number of customers on stage to talk about how the cloud is improving their operations. Airbus is using an IBM service to get a better handle on the data coming from its aircraft, said Pascal Eymery[cq], a vice-president with the aircraft maker. Its systems keep tabs on more than 20,000 operational metrics for each flight, and its next generation of aircraft will provide over 400,000 metrics, or more than 18GB for each flight. That's a lot of data to ingest for every flight around the world, and Airbus will employ IBM's cloud services for the task, Eymery said. IBM introduced a number of new services at InterConnect to help developers build such applications. One, called DataWorks, prepares an organization's data for external use. An administrator can use DataWorks to specify which fields in a database are opened for access. The software can also clean up data and convert it into appropriate formats for public consumption. IBM also announced a directory service for drawing data from external APIs, called API Harmony. A developer can enter a term into a search box, such as "restaurant reviews," and the service will return a list of APIs, along with instructions on how to connect to them. It will also release software for running IBM's BlueMix services within an organization's own data centers. BlueMix provides functionality and tools for building cloud-based applications. It lets organizations move their data to the public cloud if their computational needs become too great, LeBlanc said.